Vehicle suction cup mount - Don't put it to high on the Windshield. These suction cups are NOT permanent. Make its fall short. Vehicle power cable - Has a fuse in the end. Dashboard disc - Has an adhesive side so you can stick it on your Dash instead of the Windshield. I am putting this right up front cause ... it is probably what most of you are interested in anyway. Naturally, we must say check the Battery, but I'm sure you've done that. Next we must check the cables and make sure that the dog or cat... or child has not chewed on them. There is a fuse in the end of the cable, need to check that. Because of this step, which was learned from the forums out there, I found the next problem. And speaking of the end of the cable... make sure it hasn't fallen apart. What?? Well mine did. I keep the cable in the Truck. Most of the time it is plugged in. However, once in a while I need to use the power outlet for my, or my wife's, cell phone. I will unplug the GPS cable and lay the end in a tray on my center console. Well, vibrations shook it loose. The end just screws in and behind it are a silver tip, a spring and a fuse. The manual shows a black plastic end piece, but	mine was metal and silver. Fortunately, it was in my tray and all the pieces were found. There was also a silver metal collar around the end. So, depending on your style you may be looking for 4 or 5 pieces. There was some discussion about the high and low temps affecting the Batteries. I live in Arizona, leave the GPS in my truck all the time and have not had any problems. Well, till it fell apart. But I don't believe that temperature had anything to do with that, unless the screw in portion became looser with heat. 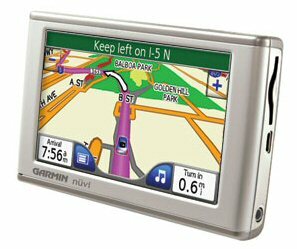 For Christmas of 2008 my daughter presented me with this nüvi® 650 GPS unit. I had, had thoughts about getting one of these but couldn't justify the price... any price, for mainly running around town. But I do some minor service calls and instead of only looking up people on MapsQuest or Google, I can enter their address on my new Garmin and be told how to get there. Very handy for some locations. The only problem I have is... the Phoenix area is growing rapidly. Awfully, hard for these GPS Navigators, any of them, to keep up. But for the most part it does well. The other reason my daughter got it for me ... she claims it is the main reason ... is, it has a "GO Home" button. No matter where you are, you push this button and it will tell you how to get back home. Go wide and arrive with nüvi 650. This widescreen personal travel assistant is packed with preloaded maps, GPS navigation capabilities and handy travel features including MP3 player, currency converter and more. Like the rest of the wide nüvi 600-series, its large touchscreen display puts the world at your fingertips. With nüvi 650's widescreen display, you'll always get the big picture. View map detail, driving directions, photos and more in bright, brilliant color. Its sunlight-readable, 4.3-inch display is easy to read — from any direction. nüvi 650 comes ready to go right out of the box with preloaded City Navigator® NT street maps, including a hefty points of interest (POIs) database with hotels, restaurants, fuel, ATMs and more. Simply touch the color screen to enter a destination, and nüvi takes you there with 2-D or 3-D maps and turn-by-turn voice directions. It even announces the name of exits and streets so you never have to take your eyes off the road. In addition, nüvi 650 accepts custom points of interest, such as school zones and safety cameras and lets you set proximity alerts to warn you of upcoming POIs. The European version even includes a preloaded safety camera database containing locations of safety cameras for parts of Europe. Like the rest of the nüvi series, nüvi 650 sports a sleek, slim design and slips comfortably in your pocket or purse. Its rechargeable lithium-ion battery makes it convenient for navigation by car or foot. Navigation is just the beginning. nüvi 650 includes many “must have” entertainment and travel tools including MP3 player, audio book player (subscription to Audible.com required), JPEG picture viewer, currency converters and more. It's compatible with optional FM traffic alerts and our free Garmin Garage where you can download custom vehicles that show your location on the map. It also comes with Garmin Lock™, an anti-theft feature. Enhance your travel experience with optional plug-in SD cards such as Garmin Travel Guides for detailed data on attractions. Thank you for registering your product. - was the greeting I got from their Web Page. Once you register your unit you can get some downloads of other neat stuff. Including some other Vehicles to use on your GPS unit. 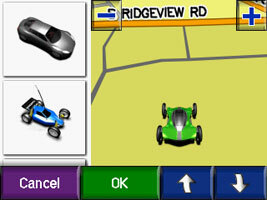 The unit will show a car, or whatever you pick, driving or moving along the route to the address you have specified. For you flying buffs, some of the choices are even airplanes. If you got a new one, with an older map, then you will probably get this message when you register. Our records indicate the device below is eligible for a free map update through our nüMaps Guarantee program. Follow the screen prompts to take advantage of this special offer today. Once again I forgot to take notes as I was doing this, but I do believe that the following instructions are for downloading the new Navigator software. It takes over an hour to download the file and then another hour or more to install it. It is not a 5 minute process. Well, ok now. Guess where I found a more informed Manual?? On the Garmin 650 itself!! Connect it to your PC and then look at it. It is in PDF format so you will have to have an Adobe Reader installed. Well, here it is Father's day June 20, 2010. My children gave me a North America map updates that is good for the life of my Garmin. Just recently it has been informing me that my maps were out of date. So this was a good... no a great gift. After the Plugin install the browser will be restarted. Sign in and you will be taken to the Update Maps page. IF you haven't connected your Garmin to your PC yet, you will be told to do so. Plug it in and let it come alive. Then click on Try Again. You will then get Confirmin Device and, in my case, a nuvi button to click. This was the first time and I had just registered and things did not go smoothly... till later. Finally got the download install working and then I went to work and let it go. When I arrived back at home it was finished. 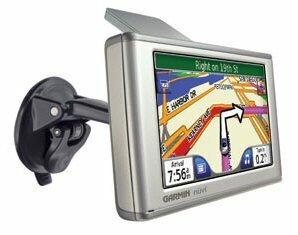 Before the Nuvi, the only GPS I'd ever used was a Garmin hiking GPS, which I purchased in 2004. It wasn't extremely easy to use, and installing maps on it was awkward. So for the longest time, I didn't bother looking at automotive GPS units, especially Garmins. My parents recently got a Nuvi 650. They're in their 60s and not extremely technologically savvy. Yet they were able to use it right out of the box, spending minimal time reading the (very short, well-written) "getting started" guide that comes in the package. They are retired and spend every winter RVing around the country, so the Nuvi is an extremely useful device for them. My wife and I got to see their Nuvi 650. We were impressed with how well designed the interface is. It's very intuitive. The screen is big and bright and easy to read in any light. We and my parents experimented with the auto-nav features and found it did a great job navigating us through complicated routes. I got the bug to buy an automotive GPS and did my research. A recent Consumer Reports issue (Dec 2007, I think, also available online) has a great review of automotive GPS units. Four of their top 5 are Nuvis (the other is a TomTom). I ruled out the TomTom because the suction mount it comes with isn't as good as the Nuvi's mount. I considered the Nuvi 660 (which adds bluetooth and a traffic receiver, but is a lot more expensive). The traffic info requires an extra cost subscription (after a free trial period). The bluetooth wasn't attractive to me for these reasons: 1) I will only use my GPS for road trips and occasional visits to an unfamiliar part of the city I live in, yet I use my cell phone all the time. 2) My car stereo already has built-in bluetooth features and, after trying them out, I ended up not using them. I ruled out the cheaper Nuvis for two reasons. Some of them have smaller screens: 3.5", whereas the 6xx series has a 4.3" screen. Second, on some cheaper units, the voice directions do not include street names ("turn left in 500 feet"), whereas on the Nuvi 6xx series, the voice directions tell you what street to turn on, as well as how many feet or miles or whatever. So I settled on the Nuvi 650. Before making the purchase, though, I was concerned that this particular model was introduced 3 years ago - a long time for a technological gadget. More importantly, I worried that the maps on it would be from 2004. 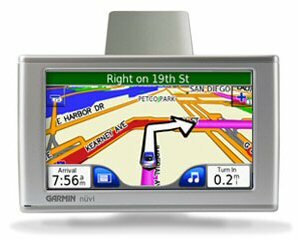 I emailed Garmin customer support, they replied in 24 hours and said that Nuvi 650s are now shipping with the latest maps - the 2008 City Navigator North America NT mappping software. If, by chance, I happen to get a unit that doesn't have the latest maps, when I register my unit online I will be able to order a free update to the latest maps. Based on this, I ordered a Nuvi 650. Sure enough, it came with the 2008 maps. Despite that this model was introduced 3 years ago, my wife and I find it very well-designed and it meets our needs very well. As others here have noted, the auto nav is not always 100% accurate - but that's true with any automotive GPS. You always must travel with a good atlas, and of course, your cell phone. The Nuvi series is great: there are lots of different ones with different features, something for just about everybody. Some reviews of the 650 complain about this or that feature missing -- fine, then look at the Nuvi line -- there's probably a Nuvi with the feature you want. Nuvis are easy enough to use right out of the box, for people who don't like reading manuals. But for those that do, it's worthwhile to spend 20-30 minutes reading the manual and tinkering with it. If you plug it into your computer using the included USB cable, it shows up as a drive in Windows explorer. You can drag and drop your favorite photos onto the photo folder of this "drive", and then view them on the Nuvi as a slide show. You can pick one of them to be your splash screen, which you see when you first power up the unit or plug it into your computer. You can drag and drop your favorite MP3 files to the Nuvi, and play them on the Nuvi's internal MP3 player. The Nuvi has an audio output jack (which takes a standard earphone sized plug), so you can play the Nuvi's sound through your car stereo if it has an auxiliary input jack. You can change the auto icon that represents your vehicle on the map; there are quite a few to choose from on the garmin website. You can change the voice that gives you directions; the English speaking voices include an American female (the default) or male, a British female or male, and an Australian female or male. My wife likes the British male voice the best. If you're multilingual or traveling abroad, you can switch to one of many foreign language voices. One last tip: The Consumer Reports article I mentioned said that thieves love to break windows and grab GPS units (and iPods, etc). The article said that you should not only take the unit with you when you park somewhere, but also remove the windshield mount - some thieves will see it and assume you left your GPS in the glove compartment, and break your window to find out. Had this GPS exactly one month, so I'm still learning about it. However, it's an extremely convenient, easy-to-see, great sized navigation tool. Can easily fit in a jacket pocket to take with me anywhere. I find it helpful just about every time I use it, and wouldn't hesitate to recommend it. But it's not the perfect answer, just a tool. You have to be aware of what it's telling you, and make decisions based on your knowledge and common sense. --Large, bright screen (which can switch to a dark backlight when it gets dark out). --Remembers lots of places you've been, easy to save places as favorites. --Need to understand what the Nuvi believes is fastest versus shortest, and when you may want to turn off highways as part of the navigation. --Sometimes the nuvi does NOT tell you to bear right or left as a road forks, and if you're not looking at the screen, you won't realize it (until the GPS-voice-with-an-attitude tells you that it's recalculating). --The precise locations of things is more of a rarity than you may think. As an example, the nuvi is locating my "home" on the street that runs 150 feet behind my house. If it's accurate to within 200 or 300 feet, that's a football field away from where you actually are. --It sometimes doesn't announce turns in advance (doesn't happen often, but does happen). --Do yourself a favor and buy (separately) the friction mount (sandbag-style) rather than bothering with the suction cup mount that's included. You'll love it, it's easy to move (either from car to car, or to put under you seat so that thieves don't see it and break in). Absolutely should be the standard mount. The 650 doesn't include a few features, such as bluetooth, that are standard in the 660 and above. If you use audio books or play music through the MP3 player, bluetooth would enable you to play through your car stereo. If you don't care about that, the 650 is a better deal. No printed manual is included -- just a Quick Start pamphlet. Do yourself a favor and go to the garmin site and download the manual right away. It'll answer a ton of questions for you and clear up things that are not obvious. I got the 650 a few months ago, and generally it has performed very well. I live in San Francisco, and two days ago, for the first time, I drove with it downtown. Now surrounded by very tall buildings the Garmin got completely confused. It generally had no idea of it's location, and the driving instructions made no sense. It had to continuously recalculate the required route, and the recalculations were meaningless. Once out of this area, operation resumed to normal. Now I understand that perhaps because of the tall buildings, satellite acquisition may have been poor, but still I expected better performance. Was just wondering if anyone else has experienced similar issues with their GPS, regardless of brand. Update 3-7-08: Purchased a Gilsson external antenna for the Nuvi, and the problem was solved. No reception problems downtown, and much faster acquisition of satellite signals on power-up. Now the next time you use your unit to navigate you will see the newly selected vehicle icon on your display. Connect your Garmin GPS device to your computer. Browse to find the “Garmin/vehicle” folder on the Garmin drive. You may need to create the vehicle folder. 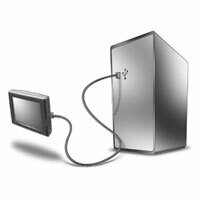 Double-click the Unplug or Eject icon in your system tray. Click Stop, and then click OK.
Unplug the USB cable from your Garmin GPS device. On your GPS device, touch Settings. I was getting, on prior updates, the insufficient space message. After a bit of fumbling around with the prior updates, I was able to get the maps on the Nuvi650 device and SD card. Reading the above post really clarified how to get the updated maps efficiently onto the SD card. It also helped that one of our local drugstores had an 8GB SD card on sale to replace the 2GB SD card. According to Garmin, the Nuvi650 can now accept an 8GB SD card. So far everything appears to be functioning correctly. I just tested this out and it worked. This is courtesy of alandb. I simplified what he suggested by simply copying the \Garmin folder on my Nuvi to the SD card. Also Garmin Express recognized the SD card so I did not have to login. So I essentially started with step #4. Worked very well and was simpler than the instructions sound. 1) Fomat the SD card FAT32. 2) Create folder \Garmin on the card. 3) Copy file garmindevice.xml from your nuvi into the \Garmin folder of the SD. 5) Proceed with the map update using MapUpdater as normal. When it is finished, you will have the 3 map files in the \Garmin folder of the SD card. They will be named gmapprom.img, gmapprom.unl and gmapprom.gma. 6) Rename the map files to gmapsupp.img, gmapsupp.unl and gmapsupp.gma. 7) Insert the SD card in your nuvi and boot. You should now be running with the new maps on the SD card. Look at Map Info to make sure the correct maps are enabled.